The Conductor's Philosophy from FXW on Vimeo. „The Conductor’s Philosophy“ – is an audio-visual work composed by Damian T. Dziwis with visuals by Felix Wiethölter. The title is based on the definition „conductor-philosophy“ – which describes that the perfect relationship between a composer and an electronic instrument is like the relationship from a conductor to his orchestra. In this work the term is redefined as an duet on a player-piano between our pianist Gabriel Denhoff and an algorithmic „virtual“ piano player. Both of them are conducted by Tobias van de Locht – the „eye“ of the virtual piano player is a MS Kinect with a special tracking software by Dionysios Marinos. The software transfers the movements of a person into data provided to the algorithms. 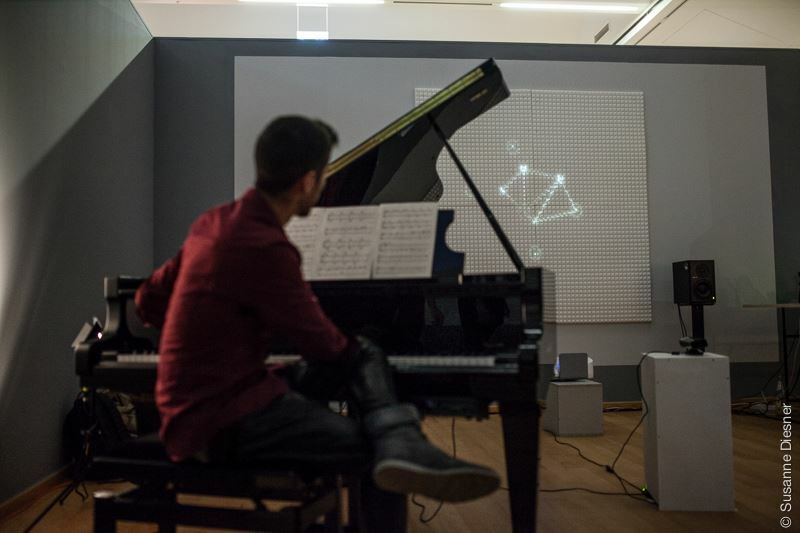 All tones played on the piano are visualized with a special square-based mapping, simultaneous played tones are triangulated – building numerous tetrahedrons reflecting the relations between algorithms, the piano as a tangible object, human interaction and visuals. The number 3 is also the basis of the composition – it’s based on a continuous tone-row of major and minor thirds and the algorithmic computed tones are intervals calculated from the last 3 tones played by the pianist. Beside the scored and algorithmic composition the third layer of the music is the aleatoric-algorithmic electro-acoustic noise- and bass-sound. It’s a metaphor for technical failures in modern electronic systems which are used as a stylistic device. „The Conductor’s Philosophy“ was premiered on the „Sciencity Düsseldorf“ Event at the „Museum Kunstpalast Düsseldorf“ in September 2013 and reperformed for the “Lange Nacht der Neuen Musik” at the Robert Schumann Hochschule Düsseldorf in 2014. The virtual pianist in „The Conductor’s Philosophy“ was realized with a Max-for-Live patch called „algorythm“, a specially developed instrument for algorithmic composition. „algorythm“ analyses the played notes from the pianist in realtime, calculates and plays adequate intervals on the same piano based on an algorithmic composition. The concept behind algorythm is to imitated the human „idea“ which isn’t simply just a random value, but a lot more a present value at single point of time from a set of possible values. This is realized with a running sequencer containing all calculated intervals, playing a note every time when the pianist exceeds a velocity value over zero. This is resulting in a composition which seems to be some kind of aleatoric, but without the use of a single random operation. „algorythm“ and the hole technical setup behind „The Conductor’s Philosophy“ was presented at the arts track of the international conference on Tangible, Embedded and Embodied Interaction – TEI, in 2014.